Tonkatsu is one of the most beloved “western style” Japanese foods in Japan. 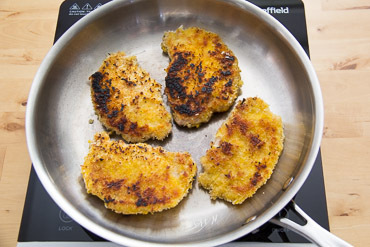 A pork cutlet is dredged in flour, egg, panko and then fried. “Ton” is Japanese for pork, and “katsu” is derived from the word for cutlet. The best thing about tonkatsu is that it’s super easy to make. The highlight of this dish is the ponzu flavored cherry compote. Ponzu (ポン酢?) is a citrus-based sauce commonly used in Japanese cuisine. It is tart, with a thin, watery consistency and a dark brown color. Ponzushōyu or ponzu jōyu (ポン酢醤油) is ponzu sauce with soy sauce (shōyu) added, and the mixed product is widely referred to as simply ponzu.The element pon arrived in the Japanese language from the English word punch. Su (酢) is Japanese for vinegar, and hence the name literally means vinegar punch. To make the dish even more Asian in flavor, mizuna would have been used in the salad. Mizuna (ミズナ（水菜）which loosely translated into English as “water greens” is also known as , shui cai, kyona, Japanese mustard, potherb mustard, Japanese greens, California peppergrass, or spider mustard is a cultivatedvariety of Brassica rapa nipposinica. The name is also used for Brassica juncea var. japonica. The taste of mizuna has been described as a “piquant, mild peppery flavor…slightly spicy, but less so than arugula. A vigorous grower producing numerous stalks bearing dark green, deeply cut and fringed leaves. They have a fresh, crisp taste and can be used on their own or cooked with meat. I Japanese cuisine, you will find them pickled. Highly resistant to cold and grown extensively during the winter months in Japan. This dish is easy to make and takes less than thirty minutes to complete, from start to finish. The finish plate for each serving is a pork cutlet topped laying on a bed of dressed arugula and with a cherry compote and a sprinkling of lemon zest. Wash produce. Roughly chop cherries, discarding pits. Peel and mince garlic. Place the pork between to sheets of plastic wrap; using a meat mallet, rolling pin or small heavy pan, pound to about an ½ inch thickness. Remove pork from the plastic and pat dry with a paper towel. To make the cherry ponzu compote: In a small bowl, combine the honey and ponzu sauce. Add the cherries and stir to combine. Taste and add salt and pepper as needed. Set aside. To bread the pork: In a large shallow bowl, combine flour, salt, and pepper. In a second large shallow bowl, whisk together the egg with mustard powder. In a third large shallow bowl, add panko bread crumbs. Season pork on both sides with salt and pepper. Add to flour, turn to coat, then shake off excess. Add to egg, turn to coat, then allow excess to drip off. Add to panko bread crumbs, pressing to adhere. To cook the tonkatsu: Heat 1 tablespoon vegetable oil in a large pan over medium heat. When oil is shimmering, add pork and cook until browned on outside, 3-4 minutes per side. Remove from pan and transfer to a paper towel-lined plate to drain. While pork cooks, in a large bowl, combine garlic, and 1 teaspoon vegetable oil. Taste and add salt and pepper as needed. Add the arugula and toss to coat. To serve, divide the pork tonkatsu and salad evenly between plates. 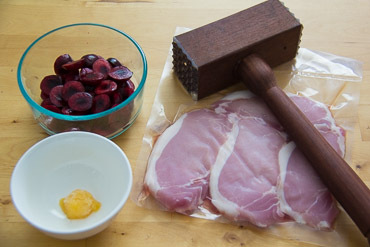 Spoon the ponzu cherry compote over pork; garnish with the lemon zest and serve. If fresh cherries are not available, frozen dark cherries can be used in this recipe. Just be sure to thaw and drain any excess water before using. This entry was posted in Asian, Fruits, Main Dishes, Meats, Pork and tagged Baby Arugula, Cherries, Easy, Egg, Garlic, honey, Lemon zest, Mustard, Panko Breadcrumbs, Ponzu sauce. Bookmark the permalink.